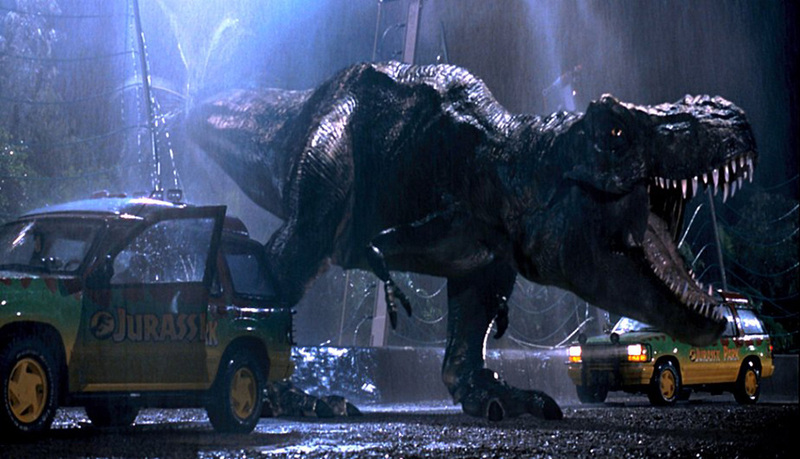 The now iconic Tyrannosaurus Rex from the film version of Jurassic Park. Crichton’s style took a little while for me to get into for a few reasons: 1) Though Crichton initially went to school for creative writing, his switch to science seems to have affected his writing style, giving it a certain clinical distance or detachment at times; 2) The book switches frequently between perspectives, from paleontologists Alan Grant and Ellie Sattler to Jurassic Park tycoon Hammond or his grandkids, Tim and Alexis, to park workers like genetic engineer Henry Wu, control room supervisor John Arnold, lawyer Donald Gennaro, and game warden Robert Muldoon. Now, take that long list and jump between each person’s perspectives every three to twenty pages. It’s a lot to take in. Truthfully, as frustrating as the shifting perspectives can be, it works as an overall structural technique. We are able to see the park from every angle, understanding the mindsets of the builders and the visitors, from the legal aspects to the practical and oppositional. Even if we disagree with Wu’s excitement about engineering dinosaur DNA without thinking too hard about how these creatures will function in a modern environment, we understand why things are happening, especially why things start to go wrong. Grant and Sattler provide much needed observations of the dinosaurs based on their expertise, and the kids give the novel that innocent excitement that very quickly turns to terror and mistrust. 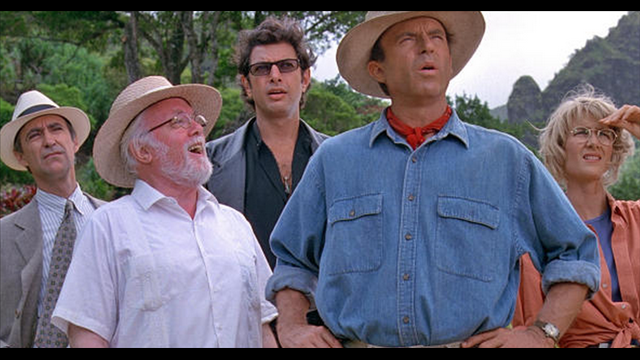 Jurassic Park main cast: (L-R) Lawyer Gennaro, Park owner Hammond, mathematician Ian Malcolm, paleontologists Dr. Grant and Dr. Sattler. Diversity in the book is limited. All of the main protagonists are white, straight, able-bodied characters, save for Henry Wu, the chief geneticist, and side characters (such as the doctors in the prologue) and the nameless Costa Rican construction workers throughout the park. Wu provides an interesting perspective, idealistic and naive in his pursuit of reconstructing dinosaur DNA, filling in the gaps with other animal DNA, such as amphibians. He clearly loses sight of the ethics of his work, focusing only on whether or not he can keep creating. He is blinded by the possibilities and potential prestige and, when faced with the consequences, does not have a slow disillusionment or redemption arc, which makes his storyline a little more complex. I’ve got another Crichton book, Micro — his final novel, published after his death — which takes place in Hawaii. I’m interested to see how his representation of diversity has progressed since Jurassic Park, especially in an environment so near and dear to my heart. If you’re also participating in the TBR Challenge, leave us a note in the comments so we can check out your book reviews this month! 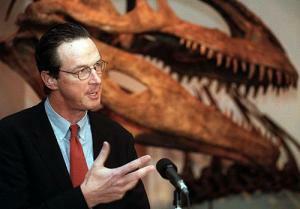 “corporate dinosaur espionage” is the coolest phrase ever, and might need to be the name of my next fictional band. I read this years ago and like you liked the panoramic view he gave us of the park. If you’re looking for more dinosaur action to tide you over until Jurassic World, I’d love to hear what you think about The Dinosaur Four. The Dinosaur Four focuses on a small group of everyday people struggling to survive in the Cretaceous, without any real discussion of science or philosophy. It’s more like The Mist (Stephen King) in that regard, but with lots of dinosaur carnage.